Discription:It’s almost time for Super bowl parties, and what better of an appetizer to have at your party than chicken wings?This marinade is both salty and sweet. The saltiness comes from soy sauce and the sweetness comes from both sugar and pineapple juice. Additional seasonings such as garlic power and ginger are added for even more flavor. The wings should be marinated at least overnight for maximum flavor. This recipe will marinate 3-4lbs of chicken wings. If you want to save time you can buy the already cut up wings in the store, or you could just leave them whole. Enjoy. Step 1: In a large bowl or sealable bag. Add chicken wings. In another bowl combine water, soy sauce, sugar, pineapple juice, oil, garlic power, and ginger. Mix well and pour over chicken wings. Cover and refrigerate. Allow to marinate overnight. Step 2: Pre-heat the oven to 350 degrees. 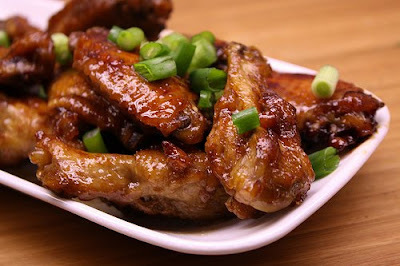 Arrange chicken wings on a foil lined baking sheet. Place into the oven and bake at 350 degrees for 1 to ½ hours.